I am wondering what size the view screen on the bridge of the USS Enterprise (NCC-1701-D) is. I want to know how it compares with current consumer display technology. I am thinking if the information is not in any of the technical manuals then it may be determined by comparing it to the height of people standing near it in episodes. Note that displays are generally measured across the diagonal between opposing corners. Bonus question: What is the aspect ratio? At the very front of the bridge chamber is located a large (4.8 x 2.5 meter) visual display panel. Given the canonicity of this information, we should interpret this as the exact dimensions. Bonus: Aspect ratio of 48:25. 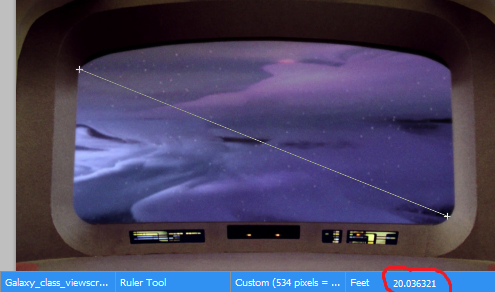 The Star Trek: The Next Generation: Companion indicates that the viewscreen is approximately 9 feet high. That would make the width 19 feet and the diagonal measurement pretty much exactly 20 feet (240 inches). The result was an Enterprise bridge set that, thanks to its nine-foot-tall viewscreen and sprawling overhead window, seems immense. In reality, however, it's only thirty-eight feet wide, the same width as the original, but it is two feet longer and has a fourteen-foot ceiling. The side ramps and various levels add to the illusion of height. Bonus answer; 19:9 aspect ratio. Using the image in Doug B's answer, we can attempt to determine the size by using the door as the scale, given that they are both nearly the same distance from the camera (the door being a little closer). Based on other clips, the doors appear to be roughly 6'8" in height. Jonathan Frakes is 6'4", and the top of the door appears to be a few inches higher than his head. If we account for shoe height, and that the average American door is 6'8", this seems like a reasonable assumption. The screen is taller than the door in the background (and roughly the same distance back back at the center of each). Measuring the height of each at the center in pixels, the screen appears to be very close to 8 feet in height. Likewise, on it's side and scaled for the angle, it appears to be roughly 2.5 door-heights wide (around 16'6"). While not definitive, I would put it at 8 x 16.5 feet (which would be a 16:33 aspect ratio). EDIT: Praxis gives a definitive answer, which is within about .75 feet of this estimate (8'2.5" tall, 15'9" wide). My guess is that it is about 12 feet by 7 feet based on the picture below. Eyeballing it, and assuming Riker is about 6' tall, it looks like the screen is maybe a foot taller than him if he was to stand next to it and not counting the control panel. It also looks to be about the same ratio of dimensions as a standard movie theatre screen (16:9). 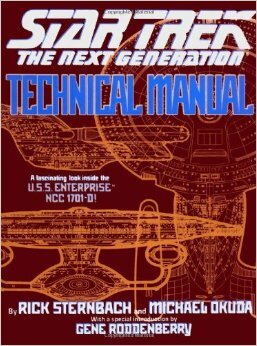 What is the outer hull of Enterprise (NCC-1701) constructed from? 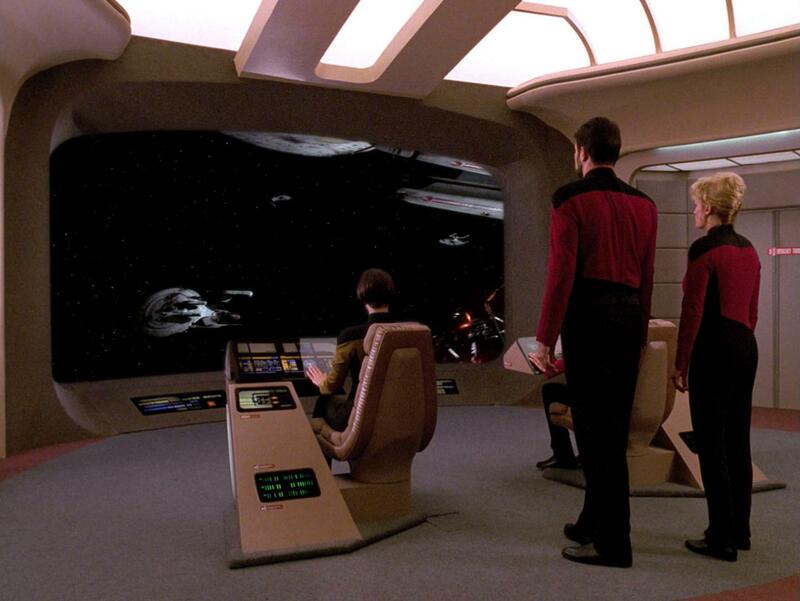 What are the various computer consoles on the NCC-1701-D's bridge?